This outstanding abstract sculpture of a reclining woman resides at the entryway of a shopping mall in Greenbrae, CA, of all places. 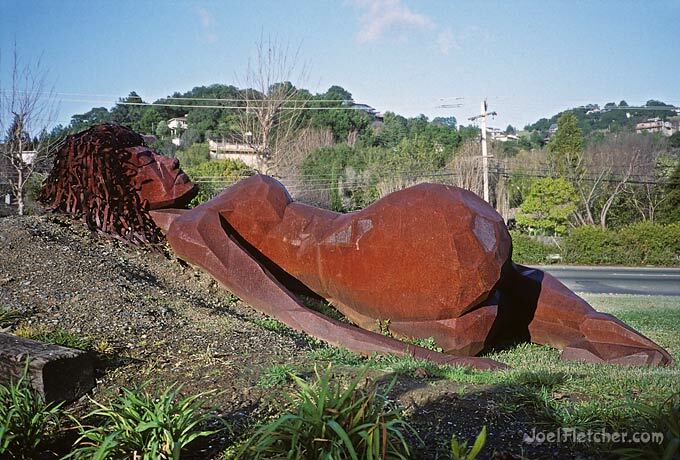 The statue is known as Tamalpais Maiden, named after the highest peak in the area, Mount Tamalpais. It was created by sculptor Dennis Patton in 1988, out of Cor-Ten steel, and is 17 feet long. I captured this reverse angle on film back in 1993, but the iconic giant is still there to this day! A front view can be seen in my Roadside Oddities gallery.